Gloves and mittens is not just for your hands any more! You can make amazing crafts from them, especially if they are old or missing one. My old favourite is making a finger puppet by drawing little characters on each finger. You can also make cute hand puppets too. For Halloween you can turn an old pair of gloves or mittens into claws for your costume. To make this you will need to sew fabric claws to the glove. You can make the fabric claws by cutting triangles from black fabric. If you can not sew, you can use fabric glue. Now you can make a really cool paper weight out of one of your old gloves....or from one of your Mom or Dad's old gloves. Trace the glove on a piece of cardboard....cut it out. Now insert it into the glove so that it keeps its shape. Now Fill the thumb of the glove with something heavy such as sand or stones. Now sew up the base of the thumb with a few quick stitches of thread. Now you are done with this handy-hand paper weight. When someone has a message for you, they can just stick it under the thumb. It is an adorable paper weight for anybody's desk. This would make a great gift for Mother's Day, Father's Day, or a birthday. These turn out to be adorable octopus puppets. You need a glove...purple works out great...but any color will do. Cut cuff from your left glove. Then cut off the thumb & 1st 2 fingers from the glove as shown in illustration a. Now slip the middle finger of your left glove on top of the small finger of your right glove. Then sew the seams together so that your finger will still fit into it (see picture b). Now filll other finger and thumb of your left glove with filler or cotton and sew to your right glove (see picture c). Now cut another finger from left glove and stuff with cotton. 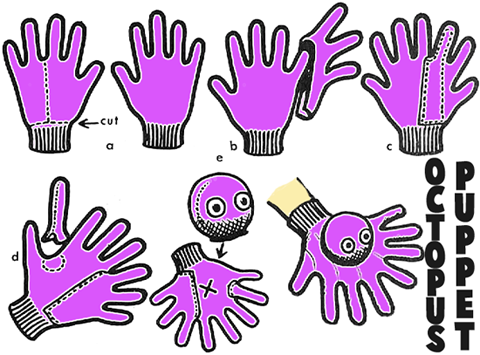 Sew it between the thumb and forefinger on the right hand glove (illustration d). Now cover a styrofoam ball ( 1 1/4" in diameter) with some of the of the left glove cuff and then sew on righf hand glove (see x on sketch e). Now your octopus puppet is done...see if it fits on your hand...then play with it. Spider Glove Puppets - And do the same project to make a spider glove puppet. Make Hand Puppets with Stuffed Animals - Make these adorable hand puppets with an old stuffed animal toy and an old glove. All you do is sew the glove inside of the stuffed animal. Find out with the following illustrated tutorial. Make Finger Puppets from Old Gloves - The tips of old gloves are perfect for making little figures / characters - like tiny little puppets. Learn how to make these. Pilgrim Girl Puppets - Learn how to make these adorable Pilgrim Girl Puppets. Glove Easter Bunny - This is an easy bunny craft that turns out looing amazing. The bunny is made from a glove, some pins, a bottle cap, yarn, stuffing, and a few other items. Make Costume Claws with Gloves - Use an old pair of your gloves to make costume claws.